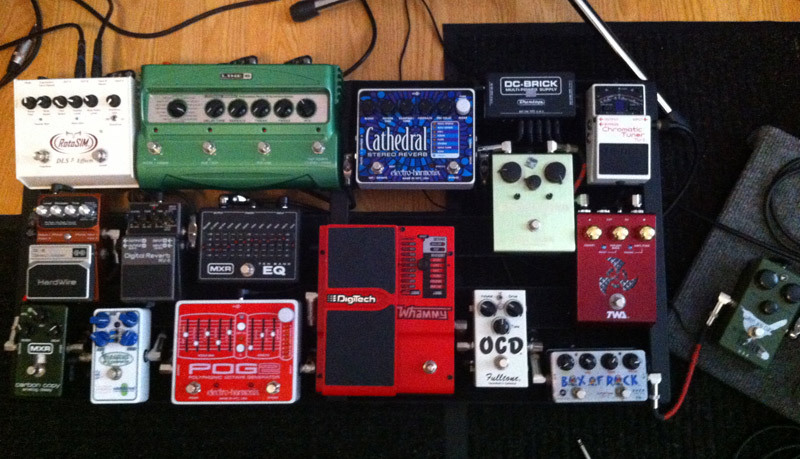 Today’s pedal line is from Mark Yoder. If you have a pedal line (doesn’t have to be in a board) for your rig, please email me a photo, bio, description of pedals and routing to pedalline@nulleffectsbay.com. Every Friday I’ll showcase a pedal line submission. Make sure you include any links to your band or music page. Just out of the picture on the right is a Morley 3-way (ABC) switcher going into a Boss FV-500 volume pedal. I use the Morley ABC to switch between guitars and a violin. * Volume pedal tuner out to Boss tuner. * Wren and Cuff Tall Font Russian: somewhat of a clone of the Sovtek Big Muff (with same nickname) in that it takes all the great specs and improves on the flaws. This is a fantastic Muff type fuzz, very touch sensitive, great interaction with guitar’s volume, tons of tonal variation depending on knob settings and guitar/pickup selection. I absolutely love it. * Zvex Box of Rock: I like different distortions for different songs, this circuit indeed rocks, plus has a clean boost. I usually run it at high gain and use the guitar volume to clean it up. Great pedal, use it all the time. * TWA Triskellion Harmonic Energizer: this filter pedal took me alot of fiddling with to truly use effectively, but now it’s an indispensable part of my board, I can’t imagine my sound without it. I tried it in every possible spot in the signal chain, but found it liked being after the fuzz and was fine after the BOR but didn’t like being buffered by the OCD, so there it sits between them. This thing is badass and can do quite a bit. You can add subtle harmonics to your distortion, add compression, add depth to your tone, fine tune your fuzz or distortion to exactly what you want, add octave type texture, etc… Everyone should try to find one of these to test out, I’m a huge fan and use it constantly. * Way Huge Green Rhino: I use this as a tubescreamer type pedal. It stacks well with other distortions and has an excellent range of gain and volume on tap. I prefer the Rhino to tube screamers for the curve knob that lets you boost the low end, which gives me greater control and the ability to make adjustments for different guitars. * Fulltone OCD: this is a well done overdrive and distortion pedal that I keep on most of the time. It has a great range for gain and grit, has great touch sensitivity and sounds great with a variety of different pickups. I keep it on the high output setting and run it on 18 volt power which I personally think allows for better control of the gain and overall tone of the pedal. * Digitech Whammy: everyone knows what this pedal can do, lots of fun and tweakability. I really love the warble you get from the monophonic tracking when you play chords or multiple notes thru the Whammy. I also use it to get an almost pedal-steel guitar sound on some settings. Of course it’s great for octave up or down lead work and it fun to get some glitchy weirdness going with the fuzz on. * Electro Harmonix POG 2: another great pitch Maxine that I use all the time. The sounds this magnificent pedal can get are seemingly endless. Being able to save your settings is key. I have settings that I play entire songs in, some for high or low pitch leads, some that make the sound go crazy, and on and on. This thing is a prize. * Catalinbread Semaphore Tremolo: a very versatile pedal, with a huge variety of wave and speed settings, it can produce any tremolo sound one might desire. This thing can do everything from super fast, super choppy sputtering to light, lovely pulsing. The sound quality of this pedal is phenomenal and the volume knob allows it to play well with all types of pedals, guitars and amps. Catalinbread has a newer version out with tap tempo that I would highly recommend. * MXR Carbon Copy: nice little analog delay. I typically keep the settings on light regen and light mix with medium delay time to add depth and texture. There is a slight volume and tone coloration with this pedal, but the overall sound is so warm that I still use it all the time. * Digitech Hardwire DL-8: the lo-fi setting on this pedal sounds superb to me, I use it alot, usually with single coil pickups. I also use the looping function quite a bit. You press down on the pedal to start recording and playback starts as soon as you lift off, which I find make it easy for me to add quick parts on the fly and layering up during instrumental or lead parts. * Line 6 DL-4: a great pedal as it seems most know. Once you’ve found what you like, it’s like having three delay pedals ready to go, plus an awesome looper. I mostly use the multi-head setting, but there are tons of great sounds in this thing. The half speed and reverse functions on the looper sound terrific and I use them often. * Boss RV-5: I keep this on the hall setting at a fairly light reverb. It’s perfect for adding depth and warmth without clouding up the tone. It does start to sound flimsy and thin when cranked, so I just don’t do that. It does the subtle thing well and works great with other pedals, an excellent foundation pedal. * MXR 10 Band Graphic EQ: I use this pedal mostly to aid me in switching guitars. When I switch from solid body to hollow body, I can setup and engage this pedal so I don’t have to make adjustments on my amplifiers controls. Although that’s my typical use for this EQ, it’s incredibly useful for getting a huge variety of tones. You can shape your tone a million different ways to sound about just like anything. I like it after all the dirt and pitch pedals so I’m shaping the effected signal. I put it between the reverbs so I could add more wetness to the signal after being shaped. Everyone should have an EQ pedal in their arsenal and I’ve found this 10 band MXR has alot of capabilities. * Electro Harmonix Cathedral Reverb: I love this pedal, the reverb is rich and musical and there is a bunch of it to dial up. I steer mostly toward the spring and hall settings, both deep and lush, but most of the settings sound lovely. This pedal can add heavy reverb without making your tone too muddy. The hold function is also a great addition that I find myself using more and more. The Cathedral sounds better than the on-board reverbs I’ve heard on many amps. * DLS RotoSIM: I’ve never actually owned or played thru a Leslie speaker cabinet, but this pedal still sounds amazing to me. It can sweep from a light chorusy-vibrato thing to a deep, pulsating chorus. You can flip between slow and fast speeds, both adjustable, with ramp up and down speed also adjustable. The RotoSIM and Carbon Copy on top of a good lead tone and you have instant David Gilmour. I run this pedal in stereo and the way it bounces the signal from amp to amp is delightful. You can also set up different parameters to function with an expression pedal, which is a bonus. Controlling the ramp speed manually is very cool, for example. Voodoo Labs Pedal Power 2: mounted underneath the board. I like that it can power Line 6 modeling pedals and has a built in outlet. Dunlop DC Brick: I needed an additional power supply that could also power 18 volt pedals. The MXR EQ runs only on 18 volts and the OCD and tremolo sound much better when powered at 18 volts.